When reviewing organic traffic of some prospective clients, we often come across websites whose organic traffic witnessed a huge dip and didn't bounce back as it should have or didn't bounce back at all. Why did this happen? How the client couldn't see it coming? Why didn't they try to find out what was behind the sudden drop? Such questions often left us wondering why clients don't understand the difference between White Hat and Black Hat SEO. But the lack of quality information in the field of SEO or more rightly put, misinformation available in the field of SEO is so high that it's almost impossible to properly differentiate between Blackhat and Whitehat SEO even for expert Search Engine Optimizers. All this made us write this article, which we feel that everyone using an SEO service must read. In this article we will cover some of the most important aspects related to Blackhat SEO, with proper proofs from Google itself. Black hat SEO has ruled the SEO world like almost forever. Even nowadays, most of the top-notch SEO companies as well as small SEO companies/freelancers are just selling Black-hat SEO techniques. That's a fact. Don't go by the pricing tag, checkout the SEO activities and the quality of work they provide. I know it's hard to believe but in this article I will try to decipher everything related to the Blackhat SEO world. Ever since Google entered the Search Engine market and consumers excessively started to depend on online information, marketers saw a huge opportunity coming there way. But why consumers suddenly started trusting Google Search Results? You see Google had bought a revolutionary change in how they ranked their results. Their ranking algo was not just evaluating simple on-page factors, which could be easily manipulated through on-page optimization, but it was evaluating a very difficult to alter factor (which Google wrongly thought at that time) i.e. Backlinks. Initially this greatly improved the quality of results, because the links were natural. In Google's own words: Google interprets a link from page A to page B as a vote by page A for page B. Votes cast by pages that are themselves "important" weigh more heavily and help to make other pages "important." Marketers realized all this. They saw this as an easy opportunity coming there way and a low hanging fruit that could be easily targeted. All this led to the link revolution, which was also one of the main causes behind evolution of the Blackhat SEO world. All sorts of large & small scale link building schemes evolved, from sham directories to link exchange etc. etc. Infact there was a term known as "Google Bombing" where Search Engine Optimizers would create huge quantity of links to the target page with a target phrase (keyword) as the link text. Initially this scheme was highly successful, until Google launched it's Penguin Algorithm update in 2012. Actually most of the Search Engine Optimizers were so much hooked to the idea of easy Link Building that they didn't realize that there could be a better approach to SEO. Blackhat SEO is not just about link schemes, there are other Blackhat methods as well, such as keyword stuffing, cloaking, etc. But Link Building is by far the most disruptive form of Blackhat SEO which is largely prevalent even today, more so because of it's inherent nature. You see when a new link building website is launched it might not be considered as part of a link scheme, but over time when it crosses the line and does become a link scheme, Google appropriately categorizes it under link schemes. So for that initial time period it might work well for the client, but when Google realizes that it's nothing but a link scheme, Google starts to take action on that site as well as the sites that used it for manipulating search engine rankings. The Penguin algo update was targeted towards these large scale link building networks. The first Penguin algo update was launched in 2012. As a result there was catastrophe in SEO companies, with clients ringing their SEO companies and shouting at the top of their voice "Where are my Rankings? ", "What happened to my organic traffic?" etc. etc. In fact there were popular SEO companies whose rankings dropped miserably after the first Penguin update itself. What remained after Penguin were deep scars in the hearts of most Search Engine Optimizers. But they still didn't realize that SEO could be something more than mere link building. They were happily selling cheap SEO services at whatever rates the client agreed to. As a result Google launched yet another update and another again till it said that Penguin will now be happening in real time. In Google's own words (from it's September 23, 2016 blog post): Penguin is now real-time. Historically, the list of sites affected by Penguin was periodically refreshed at the same time. Once a webmaster considerably improved their site and its presence on the internet, many of Google's algorithms would take that into consideration very fast, but others, like Penguin, needed to be refreshed. With this change, Penguin's data is refreshed in real time, so changes will be visible much faster, typically taking effect shortly after we recrawl and reindex a page. It also means we're not going to comment on future refreshes. In Google's own words: Any links intended to manipulate PageRank or a site's ranking in Google search results may be considered part of a link scheme and a violation of Google’s Webmaster Guidelines. This includes any behavior that manipulates links to your site or outgoing links from your site. Additionally, creating links that weren’t editorially placed or vouched for by the site’s owner on a page, otherwise known as unnatural links, can be considered a violation of our guidelines. Note that PPC (pay-per-click) advertising links that don’t pass PageRank to the buyer of the ad do not violate our guidelines. Google's goes on to say in it's article: The best way to get other sites to create high-quality, relevant links to yours is to create unique, relevant content that can naturally gain popularity in the Internet community. Creating good content pays off: Links are usually editorial votes given by choice, and the more useful content you have, the greater the chances someone else will find that content valuable to their readers and link to it. In Google's own words: Keep in mind that our algorithms can distinguish natural links from unnatural links. Natural links to your site develop as part of the dynamic nature of the web when other sites find your content valuable and think it would be helpful for their visitors. Unnatural links to your site are placed there specifically to make your site look more popular to search engines. Only natural links are useful for the indexing and ranking of your site. 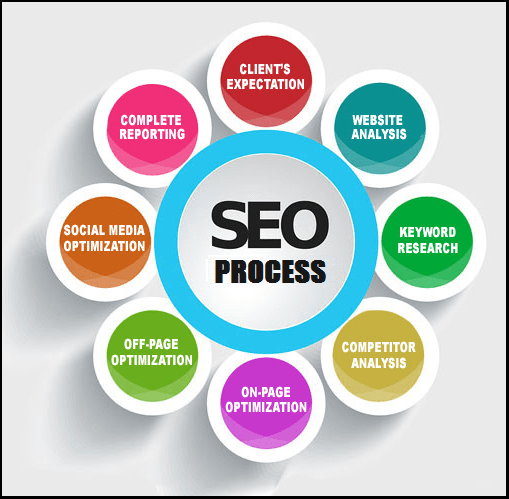 HOW OUR SEO SERVICES CAN HELP YOU GAIN GREAT ONLINE PRESENCE? Be that an e-commerce or a corporate website, all website owners need the right traffic and search engines are a great source of high quality organic traffic. A good search engine presence will not just generate unexpected business growth but boost your online reputation as well. SEO requires an efficient keyword strategy, high quality content writing, on-page optimization, quality backlinks and efficient social media marketing. These activities assist in boosting your websites appearance in search engines and help in building a natural link profile. When done in synergy and with patience, your website will rank high for even the most competitive keywords. Remember, your websites' search engine presence is pivotal for your online success.